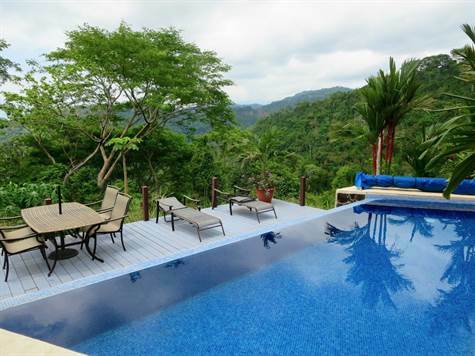 This is a property surrounded by rainforest with monkeys, toucans and many different species of wildlife and overlooking the beautiful big blue Pacific Ocean, with almost 2 acres of land and 2,800 sq. ft. of construction. A 3 stories, 3 bed / 3 bath contemporary designed home, with tall glass walls which allow to take in the natural splendor around it. As to be expected on such architectural beauty there are several luxury finishes, granite countertops and all stainless appliances. Also a convenient outside shower, a must when you’re only a few minutes away from the beach. Inside a gated community with 24/7 security.